However, the majority are still a bit fuzzy on how it works. Lasers aren’t just glowing beams from sci-fi movies. From medical to aesthetic purposes, lasers are becoming more and more common in a variety of contexts. And, for these different uses, there are different, specialized types of lasers. The type that we use at Laser by Aleya is the LightSheer Diode Laser. Complete with patented ChillTip technology, this laser has become known as the gold standard of hair removal. Lasers are unique from other light sources, like a light bulb or a flashlight, because all of the light waves in the laser have the same wavelength. Since they are the same size, the waves are able to snuggle up next to each other, like spoons. This allows the waves to travel closely together, making a beam of light that can travel long distances with pinpoint precision. So now you’re probably wondering, how does this beam of light actually remove the hair? Well, the light waves of the laser are attracted to melanin- a dark brown or black pigment, naturally occurring in the hair and skin. This pigment in the hair absorbs the light, causing damage to the hair follicle. Because darker hairs contain more melanin, laser hair removal typically performs better on them. The Diode Laser is one of the several lasers on the market specifically designed for hair removal. The Diode laser is considered superior other lasers, such as the Ruby or Alexandrite, because it offers safer and more effective penetration. The Diode Laser uses a principle called Selective Photothermolysis. It sounds complicated, but the concept is actually quite simple. Basically, the laser has the ability to target certain chromophores (in this case melanin) while leaving others undamaged. Since the skin and the hair both contain pigments of melanin, this laser is designed to selectively target the hair pigment without damaging the surrounding skin tissue. This is what makes the Diode Laser ideal for individuals for darker skin tones; a darker complexion means more melanin in the skin. Before the introduction of this Selective Photothermolysis principle with the Diode Laser, these individuals would have not been able to get laser hair removal without burning the skin. 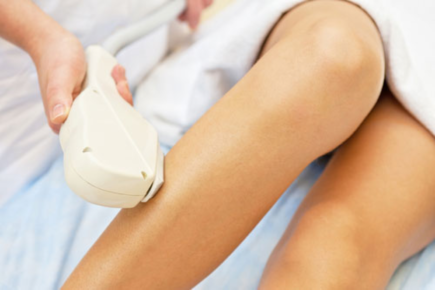 Even though the Diode Laser is designed to protect the skin, laser hair removal should always be performed by a licensed professional, with experience and demonstrated knowledge of the best safety protocols. For top rated Laser Hair Removal in Long Island, book your appointment at Laser by Aleya today.